Fused soft stand up collar. 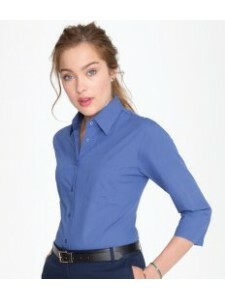 Concealed button placket. Bust darts. Two button cuffs with pointed plac..
Easy care fabric. Fitted style. Relaxed long edged collar. Contrast deep pink satin ribbon at neck s..
Easy care, wrinkle resistant fabric. Left chest pocket. Self colour buttons. Elbow length sleeves wi..
Fitted style. Easy care stretch fabric. Classic collar. Front and back darts. Self colour buttons. E..
Easy care, stretch fabric. Fitted style. Stiffened collar. Self colour buttons. Front and back darts..
Easy care fabric. Fitted style. Soft classic collar. Self colour buttons. Concealed placket. Front, ..
Easy care fabric. Soft collar. Fitted style with bust and back darts. 3/4 length sleeves with vented..
Easy iron fabric. Fused stand up collar. Fitted style with bust and back darts. Concealed placket. P..